My New Year’s resolution is to taste and celebrate a broader range of wines. This wine list is designed for the enthusiast who wants to experience quality wines, featuring selects from Black vintners from the Diaspora. . . and if you are a lover of the dryer varietals and blends, this is the list for you! This wine will make your eyes roll with pleasure. 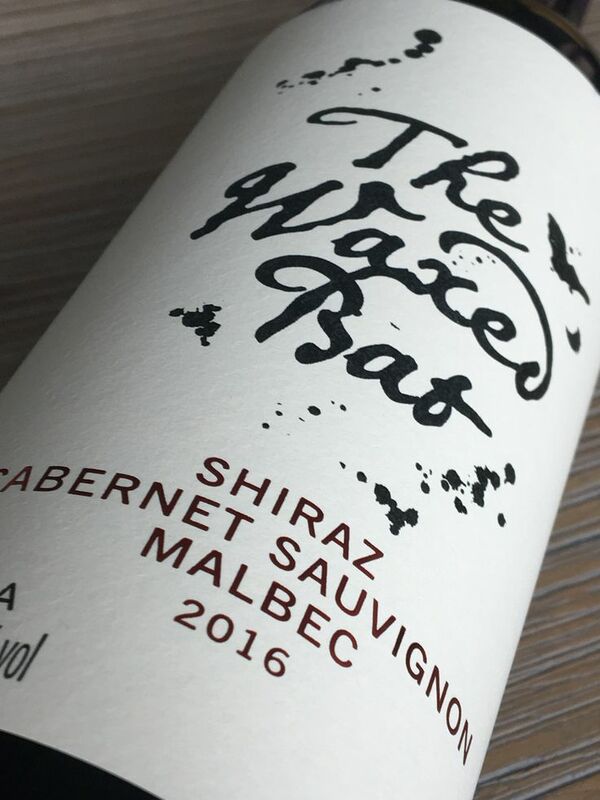 ANDEAN VINEYARD’S THE WAXED BAT – SHIRAZ, CABERNET SAUVIGNON, MALBEC is an exotic blend with dark, spicy, seductive flavors. Named for winemaker, Opi Sadler’s memories of his grandfather’s wine cellar, “where the bottles were sealed in the old way with thick, red wax….a small bat fluttering in the lamplight.” From the Mendoza region of Argentina. Awesomely delish at $12-18. I was introduced to this gem by a dear friend who had a bottle on hand. THE CHARLES WINE COMPANY’S MELANIN PINOT NOIR is a complex, medium bodied wine with dark cherry, boysenberry, and blackberry flavors, with a touch of mocha. 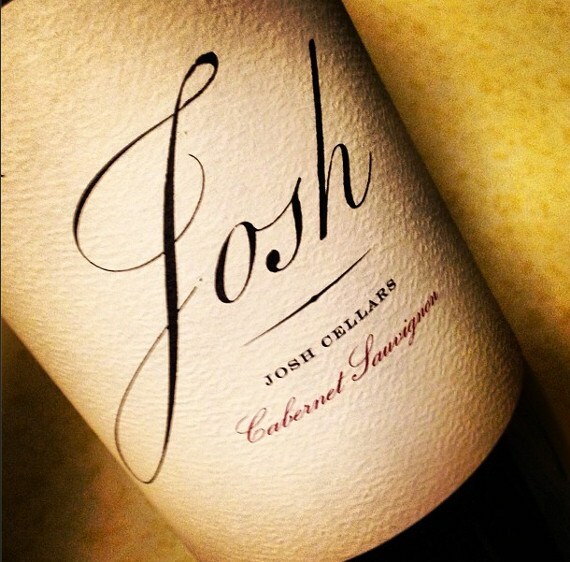 Crafted from grapes in the Lodi Central Valley, the perfect climate for varietals. This family-owned, boutique winery is expanding the availability of their wines in retail spaces. And you can always order direct from charleswineco.com.. I recently moved back to the West Coast, after several months in The South. My first stop was my fav wine spot. After catching up with my wine guy, I have a new list of wines to taste. 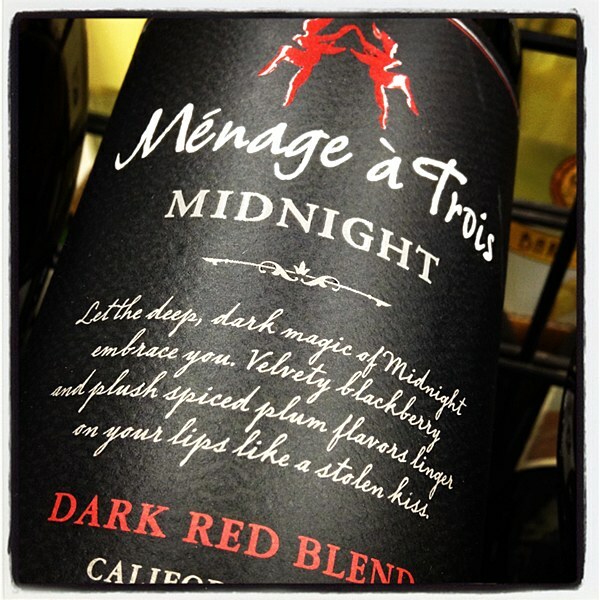 MÉNAGE À TROIS MIDNIGHT is a wine I’d seen on the shelf, but never ventured to try, until now. MÉNAGE À TROIS MIDNIGHT is a dark red blend of California Merlot, Cabernet Sauvignon, Petite Syrah, with a hint of Petit Verdot. With rich, bold, velvety, blackberry flavor, and added notes of mocha and spice, this wine lives up to its name. Priced around $16. 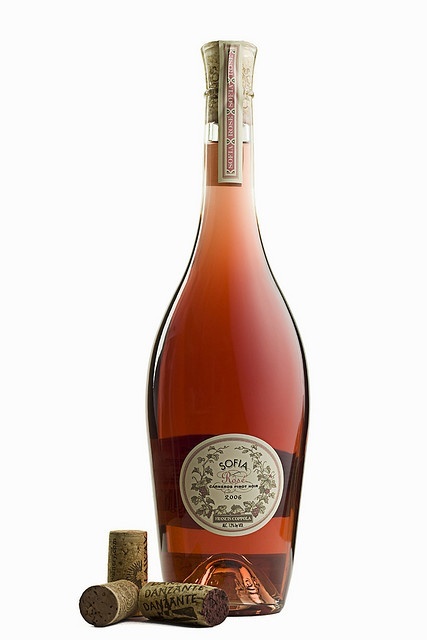 I used to only associate pink wines with syrupy sweetness, until I tasted FRANCIS COPPOLA’S SOPHIA ROSÉ. This curvaceous and very feminine bottle holds a wine that, once opened, is like perfume – with strawberry, lavender, raspberry, cherry, and citrus zests. I love it because it has such alight, fruity essence without being sweet. SOPHIA ROSÉ is a blend of Syrah, Grenache, and Pinot Noir grapes. They arrive at the serene, pink color because they cold-soak the grapes for 48 hours before the juice is separated from the skin. This wine is perfect, served chilled on a hot summer day. Usually priced between $16-$19. I would actually skip the chocolate and break out the brie to accompany this one. After the 3rd worst storm in Memphis history since Elvis (the storm, not the rock n’ roller), hundreds of thousands of residents were left without power. And, of course, this would happen during my visit. We ventured to find an open restaurant – J. Alexander’s Redlands Grill, where they served one of the best Chardonnay’s I’ve had in a long while. 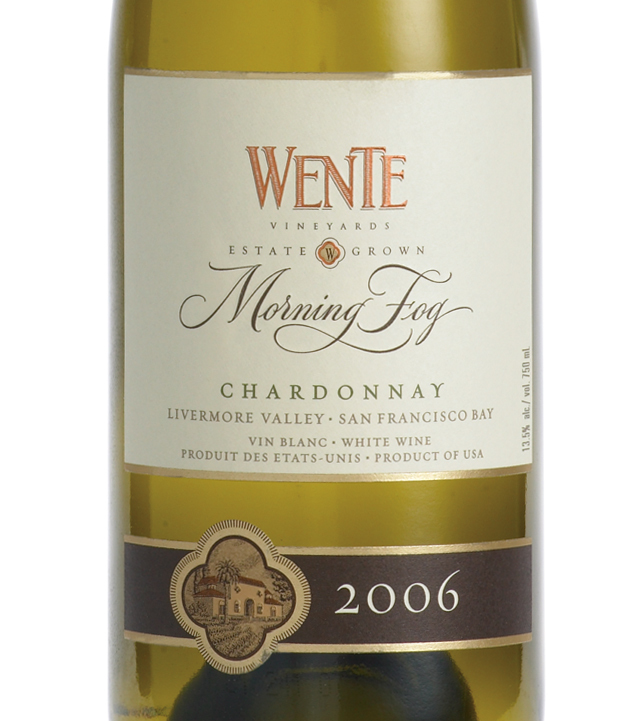 WENTE MORNING FOG CHARDONNAY is estate grown, sustainably farmed, and hand-crafted, in the Livermore Valley of northern California. Over the last few years, I have come to prefer Chardonnay’s aged in steel. And Wente does an interesting combination, as they ferment this Chardonnay 50% in oak barrels and 50% in stainless steel. The result is hints of vanilla and natural fruit flavors, with a creamy note. It’s priced $15-$20. On this occasion, I did not have access to chocolate selects. So I enjoyed my Wente with a smoked salmon salad, on toast. However, in my cocoa fantasies, I believe it would be nice with an ultra dark chocolate, that exceeds 70%, to preserve the smooth, bold flavors of this incredible wine. 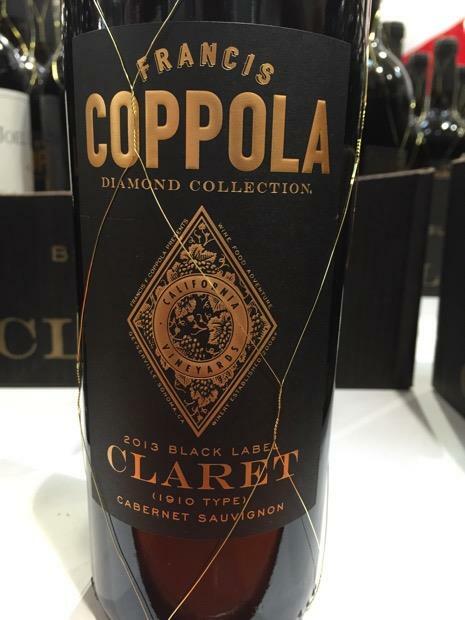 In case you’ve ever wondered what’s so special about the wine in that bottle cloaked with gold-netting, it’s the COPPOLA CLARET. A claret is a term used to describe Cabernet-based wines. The Coppola Claret is a blend of Cabernet Sauvignon, Petit Verdot, Malbec and Cabernet Franc, with flavors of blackberry, cassis and roasted espresso. Oo-la-la! Priced around $16. Quite lovely with Trader Joe’s Dark Chocolate-Covered Blueberries. ELSA BIANCHI is an unexpected, yummy treasure. This pick was completely on intuition, during a quick wine-browse at World Market. 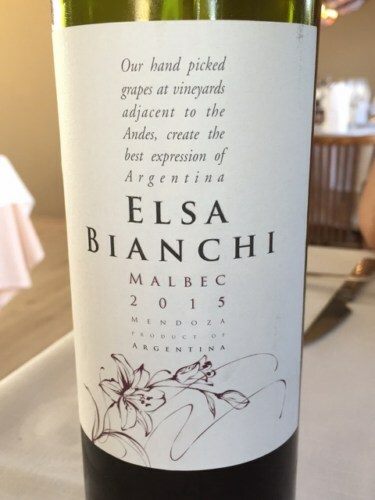 Elsa Bianchi is an Argentinian Malbec with a smokey scent, dark, fruity flavors, and a round, harmonious finish that will make your eyes roll back in your head. Priced anywhere from $10 – $15. Best with a purer chocolate, like the Endangered Species Extreme Dark Chocolate. The makers of SLEDGEHAMMER market it with a manly spin. When you visit the website it shows a guy in his backyard, cooking on the grill. They recommend the wine is accompanied with the finest cuts of steak. This wine is bold, refined and full of flavor – and definitely fit for the palette of EVE. 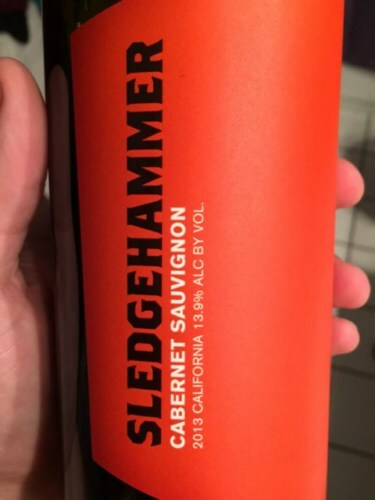 SLEDGEHAMMER CAB was first gifted to me from the secret stash of my fav ‘wine guy’ at Trader Joe’s – who carries it seasonally in limited quantities. You can always find it at BevMo, a local grocer or wine shop. The price can range anywhere from $6.99 at Trader Joe’s to $16.00. I most often find it at a ‘sale’ price of $11.99. Best served with Ghirardelli’s Dark Chocolate Sea Salt Caramel Squares. Great with Trader Joe’s Dark Chocolate-covered Almonds.